Since the early 1970s, Permascand has been the leading supplier of dimensionally stable anodes for electrowinning through the DSA Permascand® brand. Producing metals such as nickel, copper, cobalt and zinc by means of electrodes is industry standard. The advantage of DSA Permascand® is that it is more energy efficient than conventional lead anodes. In addition, there is a better working environment for operators as the amount of sludge decreases. Our world-leading brand DSA Permascand® is an important success factor for many of our customers in the mining industry. Further to the application in the electrowinning process, Permascand also have customers utilizing the electrochemical cell technology NORSCAND™ for chemical processing of battery metal salts like, for example, conversion of Lithium Sulfate to Lithium Hydroxide. “We are at our best when we work closely with the customers and develop technology together,” explains Peter Lundström, CEO at Permascand. One such customer is Glencore Nikkelverk AS. Permascand has been continuously involved in the development of anode technologies for their chlorine-based processes since the 1970s. Over the years, solutions have been developed and implemented that both reduce energy consumption and provide higher purity nickel. Nickel is an important component in products ranging from mobile phones, bridge structures, and life-saving hospital equipment to wind turbines, aircraft engines, and space shuttles.Glencore Nikkelverk AS currently has a production capacity of 92,000 tons and is producing the purest nickel in the world. “We are on an exciting journey, together with Glencore Nikkelverk AS,” says Erik Zimmerman, product manager at Permascand. Work is continuing in other, new areas, testing new technical solutions for a more energy-efficient production of copper. Here, test measurements and development work are taking place with Permascand’s electrode technologies in a completely new pilot plant. 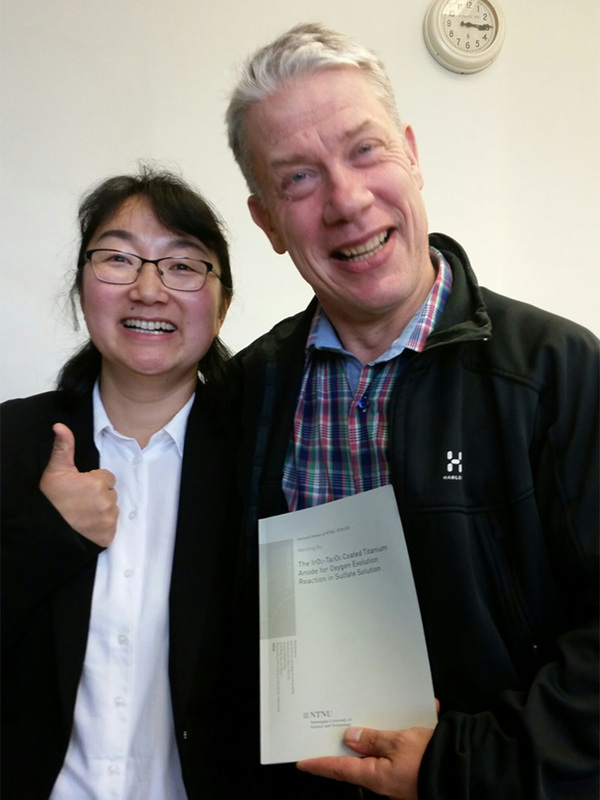 Wenting Xu successfully defended her PhD thesis on oxygen evolving anodes for copper electrowinning at the Norwegian University of Science and Technology in Trondheim. Here together with Erik Zimmerman, product manager at Permascand.